With 7/10’s of the world’s surface covered in water it’s not surprising the growing popularity of underwater photography in the digital age. But the equipment needed can be prohibitively expensive, with the cost of water-housings and diving gear adding up to thousands. I’ve never been much of an underwater photographer, in fact, the only time my camera gets wet is when I get caught in the rain. This hasn’t stopped me notching up some impressive stock sales from images from the world underwater. The image above of the aggressive and predatory Bull Shark was shot from a distance of maybe 2 metres. I was surprised I could hold the camera steady. Luckily the reinforced glass between us made it easier for me to hold my nerve, the image was shot at Sea World on the Gold Coast. 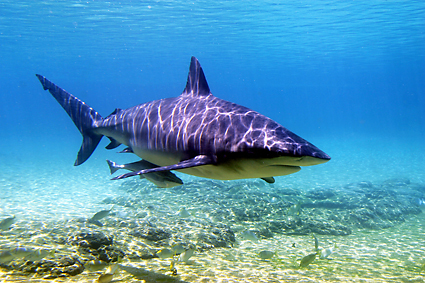 That’s about as close as I want to get to a Bull Shark but the resultant image has sold several times through my stock library. 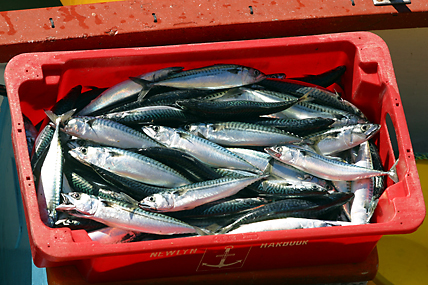 Fresh, line-caught mackerel, on the harbour wall at St Ives, Cornwall. Now here’s a fish I don’t mind getting up close and personal with, the mighty mackerel! The small sweet Cornish variety is probably my favourite fish. Simply fried in olive oil, coated in seasoned flour and topped off with a little pepper and brown vinegar, it’s hard to beat. This image was a lucky occurrence, the afternoon catch being landed at St Ives, Cornwall just as I was out strolling with the family. The red box adds a bit of punch to the image and it has been a consistent seller since 2004 when it was shot. Perhaps the surprise best seller of recent times has been another monster of the deep, The Big Lobster! 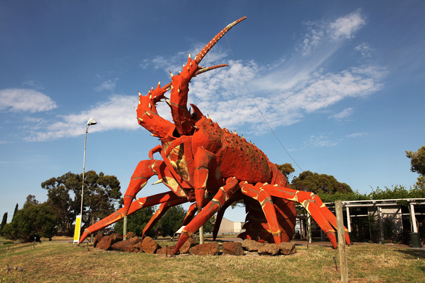 One of Australia’s iconic “Big Things” (The Big Pineapple, The Big Sheep, etc), the Big Lobster in Kingston, South Australia is one of my favourites. And I’m not the only one who seems to like it because this image has already sold 5 times this year! The most recent sale was for the cover of a book ……. probably either about lobsters or about “Big Things”, I’ll find out a bit later. In the meantime, I can’t wait for the “Big Prawn”, down the road in Ballina, to renovated so that I can do a bit more underwater photography ….. This entry was posted in photography, Stock photography and tagged alstonville, ballina, Bull Shark, Cornwall, gold coast, Kingston, mackerel, northern rivers, photographer, photographs, photography, Sea World, St Ives, stock photography, The Big Lobster, underwater photography. Bookmark the permalink.